Another Auto AXIS® destined to become a classic! The Bedlam feature the Auto AXIS® pull release with integrated safety. Just pull back on the axis lock and the blade opens automatically. The blade is BK1 coated 154CM stainless steel (58-61HRC) with plain edge. Features black G10 handle scales and tip-up reversible clip. Lost my Benchmade Barrage a year ago and felt like I lost a loved one. Bit the bullet and bought the Bedlam. My edc, work knife, fight knife, fidget knife, my everything knife. I look forward to using the crap out of it and growing old with it. Thank you Blade HQ for great service. It’s the knife in a popular video game and it’s well made. Not a hard use knife at all but it looks cool. Deep pocket clip is nice. My girlfriend got me this knife as a gift. Absolutely love it. The action is smooth. Flies open and best of all is the life sharp that it comes with. 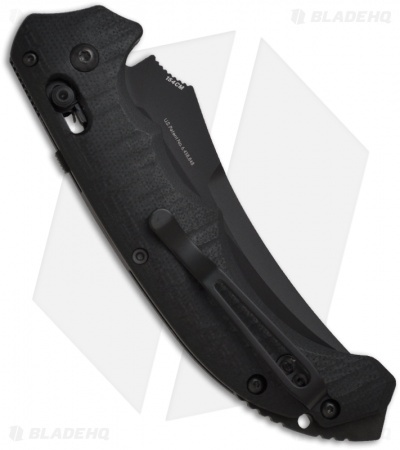 Amazing tactical edc or self defense knife. I have used and abused this knife for two years now. Its probably been opened and closed a thousand times with no problems. I have to sharpen the blade about every six months just because I cut cardboard, heavy plastics, and even meat on camping trips. The skull cracker on the bottom will do some damage if in a self defense situation, but with the size of the blade it probably won't come to that. This is a worthy blade for your pocket. 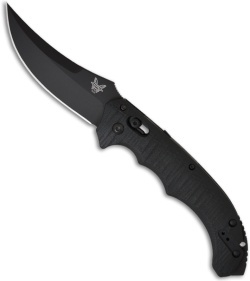 Well made Benchmade of course, no wiggle in the blade. Extremely sharp out of the box with a quick action snap-out. Only item which took me a bit of getting use to was the safety mechanism which was very tight until given a touch of oil which assisted in loosing it but it still remains a bit tough to pull with your thumb. The grip fits perfectly in your hand and has a nice feel in the material. A well-made, strong and worthy knife! Get everything you pay for! You can shave with this knife out of the box, easily cut my arm hair of clean. Knife feels perfect in the hand, and fits nicely in my pocket. This is my new daily knife and does everything perfectly! This knife will put a smile on your face. 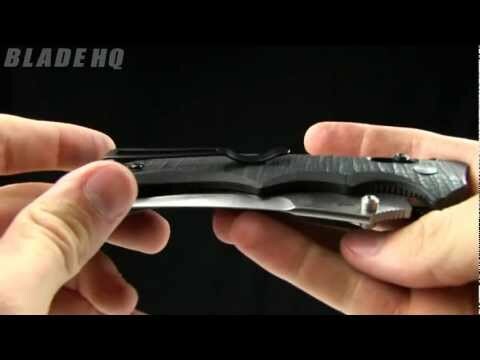 This is my favorite Benchmade and here is why: Feels great in the hand- just look at the size of it. Flies open and locks up and is strong and tight. People may want to knock the blade shape because it looks like Persian style. Well if you were having to do gutting or cleaning a fish you wouldn't be knocking this blade at all. There is a reason why this blade shape works so well for many uses. Looks great and feels great in the hand. The Bedlam puts most all other EDCs to bed. A very useful and fun knife. Great in the field.